Lynn Nottage brings a fresh eye to labor, capitalism, and the American factory worker in Sweat. After transferring from The Public to Studio 54 on Broadway, Lynn Nottage’s blockbuster play Sweat, is worthy of all the considerable hype. Gritty, unapologetic, and never timid, the play examines the troubled lives of its blue-collar characters with stunningly compassionate introspection. Part of the play’s power comes from Nottage diving deep into a familiar and well-worn story line and bringing her masterful eye to it. Set in the factory town of Reading, PA, we quickly see the past few decades have been unkind to it. This town and its people rely on the labor-intensive but steady and good-paying jobs of the factory. When management eventually turns on the workers and the factory closes, lives are destroyed. The finely-tuned realism of the characters and the play are an outcropping of the playwright’s diligence: Nottage spent over two years interviewing residents in Reading before working on her script. It is clear that in those many months, Nottage came to know the subjects of her study intimately, and has told their story with insight and empathy. The cast is universally strong, but those who are given the most opportunity to shine are Khris Davis and Will Pullen. As the 20-something Chris and Jason, these two represent the younger generation of factory workers: both of their mothers still work there, and nearly everybody else in their family has done so too. So Chris and Jason are full of life and optimism about their jobs and secure futures at the factory, and therefore lose the most when it is ripped away from them. Nottage, in fact, opens the play eight years after the factory has closed, once life has gone in scary and unexpected directions for both Chris and Jason. 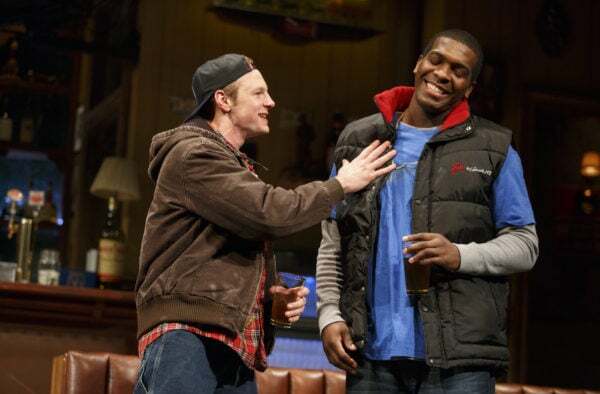 As Nottage moves back and forth between the play’s two settings of 2008 and 2000, Davis and Pullen are asked to create very different renditions of their characters. Other actors are called upon to do the same, but for the older generation, their job is mostly to render their formerly vibrant characters as rundown and defeated. Davis and Pullen must take Chris and Jason into very new emotional terrain in their 2008 scenes, and they excel in doing so. The anguish and bewilderment of the entire town becomes clear in these two characters as we see lives not simply shattered, but driven widely off course. These and other transitions in character are guided by the steady directorial hand of Kate Whoriskey, who is impressively attuned to character, play, and space. The play is at once chaotic and measured, always aware that the powder keg may at any point blow, but in no hurry to set it off. As Nottage has done so effectively and so frequently in the past, she finds success here with taking a big-picture event as a starting point from which she might turn her attention to the human lives at the core of history and chaos. Sweat makes clear and overt political statements about workers’ rights, trade, and the callousness of capitalism, but it is, at bottom, a play about people and their fears. Sweat is just the latest testament that there is perhaps no better contemporary playwright at combing the rich nexus of history and humanity than Lynn Nottage.